It was March 20, 2010. 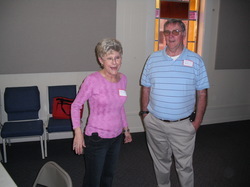 The annual Mill Village Reunion was held at Living World Fellowship Hall in Jefferson. I have always been a “sucker" for a reunion. I’d probably attend the 1935 Martin Institute Reunion if they had one and I could get an invitation. I have been known to just show up at some reunions. This was the case when I attended my first Mill Village Reunion back in 2008. I was amazed at the people I ran into that I had not seen in many years. Last year was probably the most enjoyable for me of all the Mill Village Reunions I have attended. I was reunited with some former Jefferson High School people I had not seen in many years. Included among these people were Reba ( Ricks ) and Leon Holmes, John Bryan, Johnny Colvard, Harry Bryan, Peggy Irvin, Diane Couch Phillips, Dillard Phillips, Andrea Couch, Joe Couch, Sandra Duncan Howington, Dugar Strickland, Webster Tolbert, Connie Taylor, Dillis Whitmire, Danny Allen, Brenda Samples Riddle, Burton Riddle, Janis Magnum, Ralene Howington, Buddy Tolbert, Ostell Anglin, Steve Anglin, Bosie Griffith, Charles Anglin, Larry Wood, James Stringer, Andy Garrison, Butch Porter, Judy Jackson, Gail Boyd Barchuk and Kaye Manus Seabolt. For some of these people I have used their maiden name in that I simply cannot remember their married names. While I may not be as strong on remembering full names as I probably should be, I still remember the names I knew them by many years ago. I don’t believe I could ever forget them even if I tried. To those that were in attendance that were left off the list, and there were quite a few, I’ll apologize. This year, I plan on getting numerous photo’s for my cecilbuffington.com web-site. The ladies that put on this event each year are to be commended for their dedication to perpetuating these wonderful memories of the Golden Age of Jefferson. The Jefferson Mill Village will always be remembered by those of us that grew up in that Jefferson Mills environment or were close friends with classmates that lived in, and in many cases, spent their childhood in those mill built homes. Dillis Whitmire, Sandra Duncan Howington, Diane Couch Phillips and others plan and organize the event each year and guide it to its conclusion. The Jefferson Mill Village Reunion is high class in every respect and very well organized. It is informative, entertaining and just a fun event to be a part of. The fellowship exhibited during the reunion is amazing as many old stories are recounted from our Jefferson High School days of the 50s and upward as we moved forward with our life. There are old Mill Whistles and numerous photo’s of the 50s, 60s and forward in our Jefferson history brought in and displayed for all to view and reminisce. Those that attend the luncheon function are asked to bring a dish or food item to share with their fellow attendees. It is always very good and as far as I can see, provides a tasty entree and some fabulous deserts for everyone. There are a lot of good cooks that came out of the Jefferson Mill Village. Now it’s a year later. It is now time for another Mill Village Reunion. Only the date has changed from 2010. Saturday, March 12, 2011 ~ Same time as 2010 ( 11:00 a.m. - 5:00 p.m. ) ~ Same place as 2010 ( Living World Fellowship Hall ) in Jefferson. I’ll attend of course, and probably stay all day. I usually plan on leaving after lunch, but find it hard to push myself out the door. The event has grown larger each year. It is likely to continue that trend. I find it somewhat amazing that some people are able to make a friend in the first grade and remain a friend with that person for 50, 60 years or even longer. It’s events like the Jefferson Mill Village Reunion that enhances the likelihood of such a marvelous thing happening. Some 2010 Reunion scenes . . .
An always smiling Judy Jackson. Dillard Phillips and Janice Mangum. Below . . . Diane Couch Phillips and Burton Riddle mug for the camera.